For fast performance in both capture and transmission, excellent for the dynamic world of Electronic News Gathering (ENG) as well as journalistic, documentary, corporate and higher education video production, look no further than the XA40 Professional Camcorder. Featuring an advanced 4K UHD CMOS Pro Image Sensor, a powerful DIG!C DV 6 Image Processor and a phenomenal 20x High Definition optical zoom lens, the XA40 camcorder captures expansive, high-quality 4K UHD video. Dual SD card slots that are compatible with universal SD, SDHC and SDXC memory cards provide super-high capacity and ultra-fast data transfer. 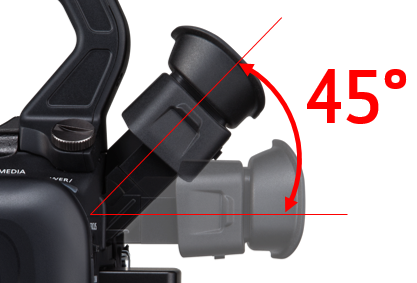 The compact XA40 includes a detachable handle for low-angle shooting and portability. Functionality is further enhanced with the addition of XLR inputs and an external microphone holder when the handle is attached. 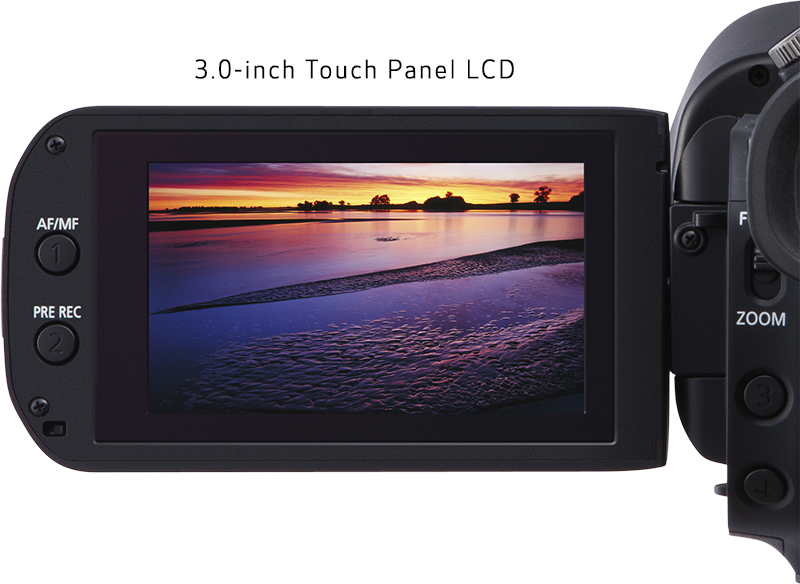 Combining a lightweight design, a 1.56 million dot electronic viewfinder and a 3.0-inch capacitive touch panel LCD, the XA40 is comfortable to operate for extended periods of time and in numerous environments. When there's no telling what or where the next story will be, the XA40 is ready to go. A remarkably versatile, powerful and compact camcorder, it delivers the quality, speed and connectivity to drive a 24-hour news workflow. The XA40 Professional Camcorder features a Genuine Canon 20x Optical Zoom Lens that provides a highly versatile zoom range with a 35mm equivalent of 29.3-601mm to help capture newsworthy recordings near and far. The impressive image quality is enhanced by an 8-blade Circular Aperture design, which helps to avoid the "starburst" effect of point light sources in non-circular aperture designs. Out-of-focus areas are smooth, natural and appealing. An endless-type focus and zoom control includes user-programmable direction and sensitivity modes. Zoom speed can be set to either a variable or constant (with 16 levels) speed setting, with Fast, Normal or Slow zoom speed levels. For incredibly sharp and detailed high-definition video recording, the XA40 Professional Camcorder features a 1/2.84-inch, 8.9 Megapixel 4K UHD CMOS Pro Image Sensor that captures approximately 3840x2160 pixels. Thanks to the sensor's high sensitivity, the XA40 helps provide vivid, accurate recording through an excellent signal-to-noise ratio. Multiple recording modes, resolutions and frame rates make the XA40 Professional Camcorder creatively flexible and adaptable to virtually any news-gathering environment. It can record to an SD card in 4K UHD and Full HD resolutions using the MP4 recording codec, at multiple bit rates- and even record simultaneously. 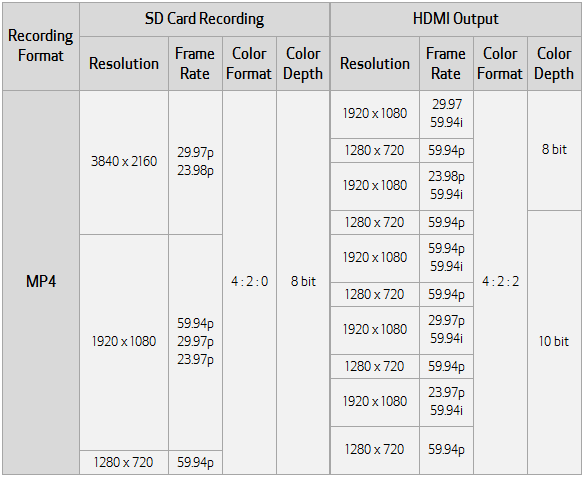 An HDMI terminal supports FHD 60p output, which can be connected to a standard external SSD/HDD recorder, enabling conversion to ProRes and DNx formats for efficient editing and storage. The XA40 Professional Camcorder features dual SD card slots that are compatible with universal SD, SDHC and SDXC memory cards, which provide super-high capacity and ultra-fast data transfer. With Relay Recording, the XA40 Professional Camcorder automatically switches video recording from one SD memory card to the other when the first memory card becomes full. 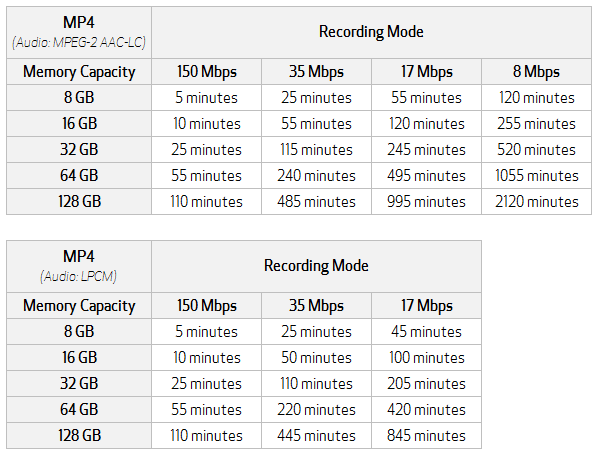 Dual Recording offers format choices that are useful for various post-capture options. The DiG!C DV 6 Image Processor and dual SD card slots enable simultaneous recording the web-ready MP4 format, at different bit rates. Slow and Fast Motion Modes allow the XA40 Professional Camcorder to record a different frame rate than the playback frame rate for a fast or slow motion effect during playback. 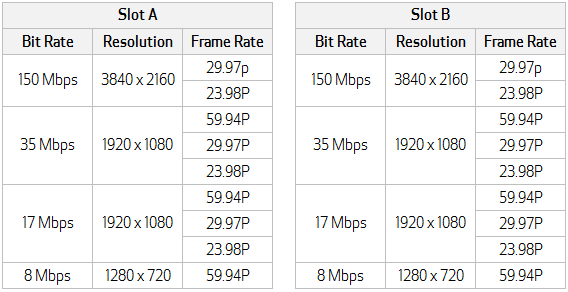 Since the camera is recording real frames and modifying the playback rate, there is virtually no quality loss and maximum image quality is maintained. 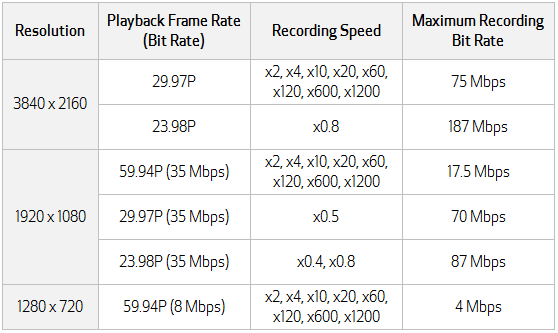 Additionally, interval recording allows the user to record frames at specified intervals, providing time-lapse recording of up to 1200x and slow motion down to 0.4x of the original speed. 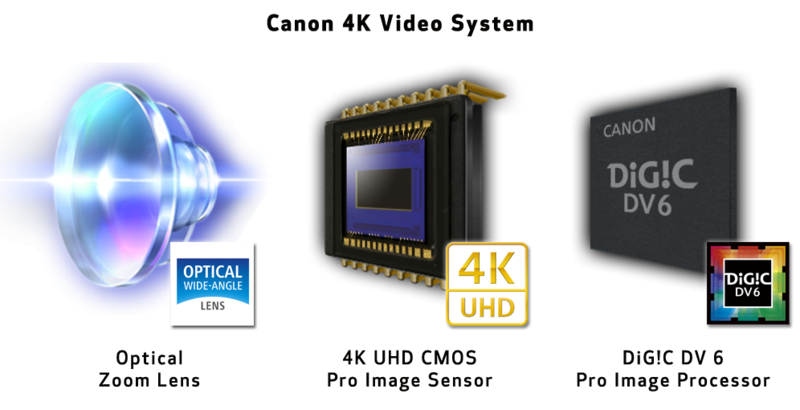 Our Full HD image quality from our XA series camcorder is now even better thanks to Over Sampling HD Processing, which enables Full HD recording by effectively utilizing the outstanding capabilities of the 4K UHD CMOS Sensor. 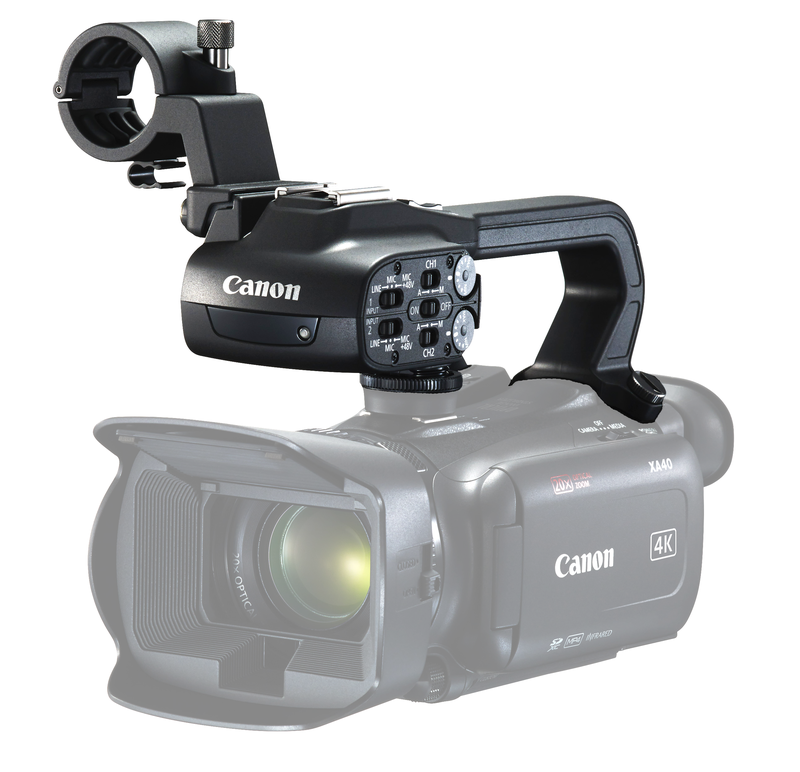 The XA40 Professional Camcorder represents Canon's 4K UHD System, delivering truly excellent image quality and reproduction for most any news-gathering application. With its 20x Optical Zoom Video lens, its 4K UHD CMOS Pro Image Sensor and the powerful DiG!C DV 6 Image Processor working together to capture and process the images at hand, the XA40 is positioned to deliver HD video that is nothing short of stunning. The 0.24-inch tilt-type color electronic viewfinder on the XA40 Professional Camcorder has 100% field of view, and 1.56 million dots of resolution help ensure critical focus adjustment, with peaking applied if necessary. The viewfinder can tilt up to 45° for low-angle shooting. A joystick located to the right of the viewfinder, where the thumb rests, enables control of camera settings on the viewscreen without having to use touch panel controls. The XA40 Professional Camcorder offers a powerful optical image stabilization system suited to help reduce image blur in a wide variety of shooting situations. The different image stabilization options can be selected manually, or Intelligent IS can use an automatic detection system to identify the proper stabilization mode for the situation. 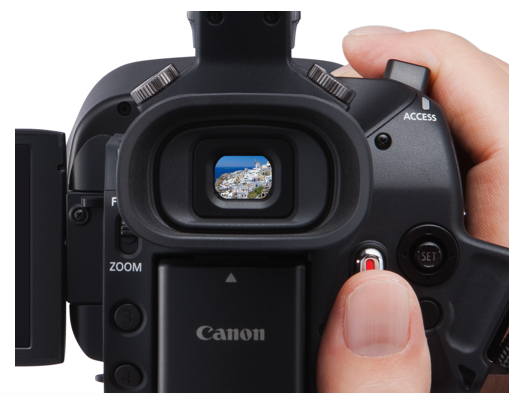 Featured on the XA40 is Dynamic Mode, which provides electronic correction of roll and tilt. Manual exposure: When manual control is selected, the dial can adjust aperture, shutter speed or gain. Select items to adjust, such as aperture or other settings, with the key. With the Level Marker feature, it's easy to keep the camcorder level for more accurate framing. The Grid Marker provides a reference grid in your viewfinder. Depending on the background color of your shot, you can choose between two different colors (white or gray) for better viewing contrast. Power zoom is available in Variable and Constant settings in 3 modes: Fast (approx. 1.9–60 seconds), Normal (approx. 2.5-180 seconds) and Slow (approx. 4.0–285 seconds). To provide added control, there are 16 predefined steps in Constant mode. Weighing less than three pounds including the detachable handle, battery and lens hood – and less than two pounds without – the XA40 Professional Camcorder is ideal for high-action shoots when both speed and mobility are essential, and where keeping a low profile is an added benefit. Though small in size, this camcorder sacrifices nothing when it comes to professional functionality. It features a "seesaw" style zoom lever, manual focus/zoom ring and selection switch, a joystick for easy control and an electronic viewfinder that can tilt up to 45° for low-angle shooting. It also has five assignable buttons to help it fit to your operational needs. 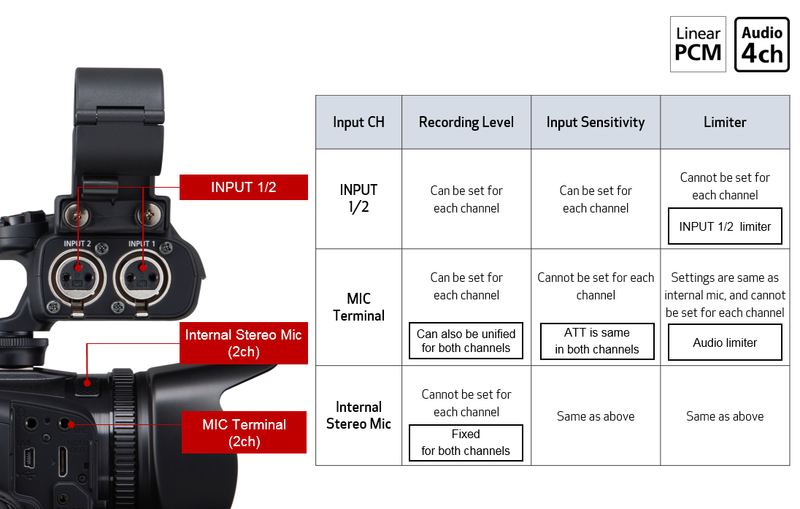 A stereo microphone is incorporated into the XA40 Professional Camcorder, and two XLR audio inputs with +48 V phantom power is on the detachable handle unit. The built-in microphone supports plug-in power, and provides outstanding audio in fast-paced situations while the XLR inputs provide connectivity to external microphones and other professional audio devices. If you choose, the built-in microphone and XLR input can be used simultaneously. The XA40 also includes a 3.5mm headphone terminal with 16 volume settings for accurate audio monitoring. The XA40 Professional Camcorder offers a variety of ways to record audio: through two XLR terminals, an internal stereo mini-jack mic terminal or from the camcorder's internal stereo mic. In addition to AAC 2ch audio, XA40 offers support for high-quality linear PCM 4ch audio and manual gain control. The on-board 4ch audio independent settings let users set recording levels, input sensitivity and limiters for each channel. 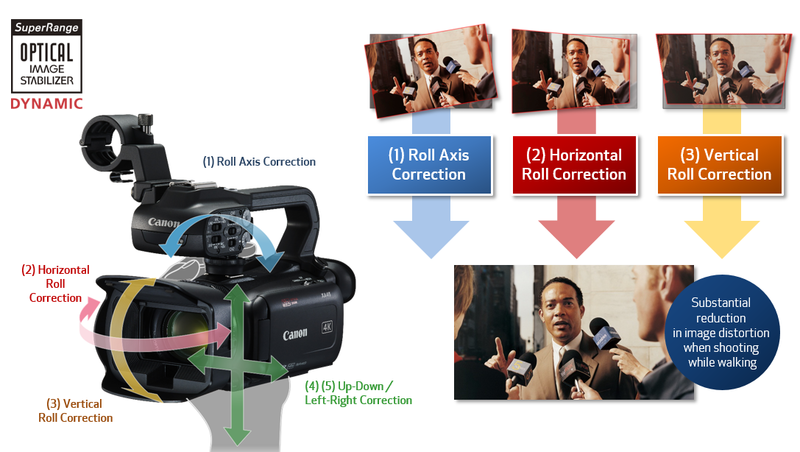 To enhance focusing capability, the XA40 Professional Camcorder provides Focus Assist. It includes enlargement, which helps in capturing your subject in razor-sharp focus. It works by providing a 2x magnification of your subject, which is automatically cancelled when you start recording. Also included is color peaking, which shows the shooting object's focused areas in actual colors. 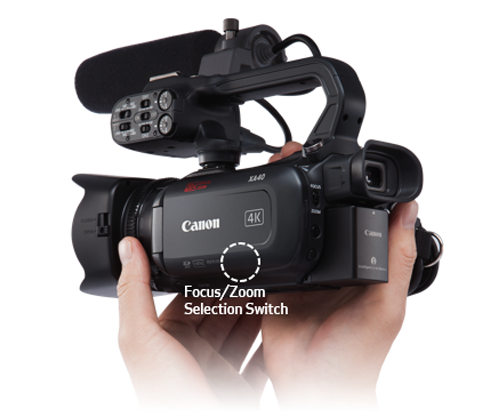 The XA40 Professional Camcorder is equipped with five assignable buttons so that the camcorder can be tailored to the specific preferences or needs of the user. Button 1 is preset as AF/MF. Button 2 is preset as Pre REC. Button 3 has no preset. Button 4 has no preset. Button 5 is preset as Rec Review. The XA40 Professional Camcorder features an Infrared Mode allowing the capture of video in conditions with little to no ambient light. Compared to the XA25 and XA20, the XA40 can shoot at brightness levels that are approximately 1.4 times more sensitive, and allows low-light capture by removing the infrared cutoff filter from the optical path. Its specially designed lens coating allows the infrared light to pass through to the image sensor. 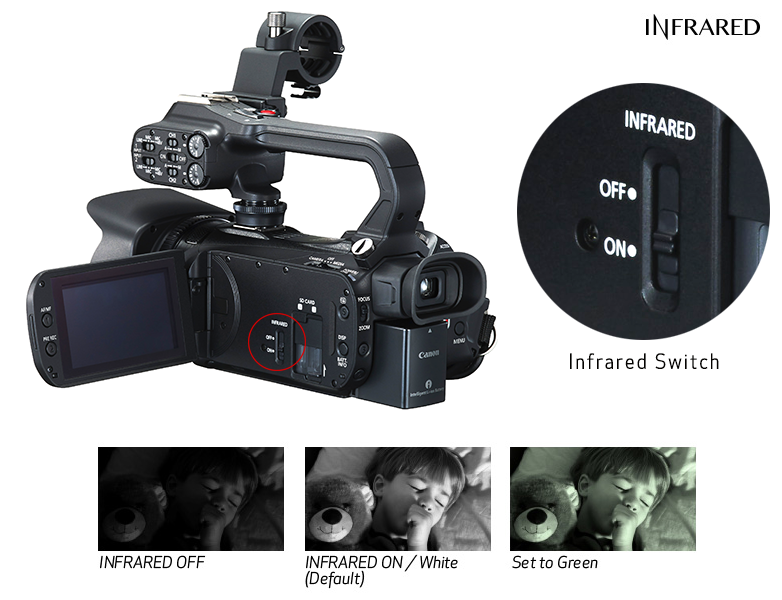 Additionally, the detachable handle of the XA40 features an infrared emitter with a diffuser to shoot appealing infrared imagery even in complete darkness. For evening camera crews or nature documentary makers, the benefits of a compact, high-performance camcorder for shooting in such conditions are obvious. Without the need to add lights, the shooter can save time on set-up, or blend into the background to reduce their chance of being seen by the subject. Also, the XA40 gives the option of recording in white or green mode. Color bars and test tone can be selected and recorded. The color bars comply with the SMPTE standard. -12 dB, -18 dB or -20 dB can be selected as the test tone. Enhanced zebra pattern (70% or 100%) indicates "blown out" or high brightness areas to help you set the proper exposure. The white balance control has six available presets selectable through a variety of day and artificial light conditions (Daylight, Shade, Cloudy, Fluorescent, Fluorescent H and Tungsten), as well as two manual white balance settings. Color temperature may also be manually set from 2,000K to 15,000K in 100K increments for more precise adjustment.